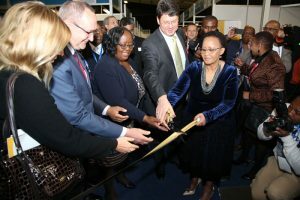 Business leaders from across southern Africa converged on Johannesburg yesterday as two of Africa’s biggest trade shows opened for the first day. Thousands of participants attended the Gallagher Convention Centre in Johannesburg for SAITEX 2016 and its co-located show Africa’s Big Seven. SAITEX is the biggest event in Africa with almost 600 exhibitors from 26 countries attracting buyers from around the world. 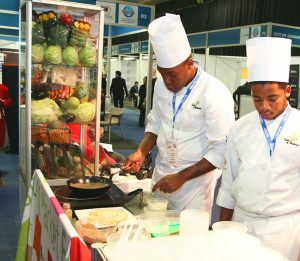 The second expo is Africa’s Big Seven, the largest food and beverage event on the continent. The first event of the day at SAITEX was a business breakfast organised by the Progressive Business Forum (PBF), which has 5,000 members across the country. Attendance exceeded the original 300 people and more tables had to be brought in to cater for demand. 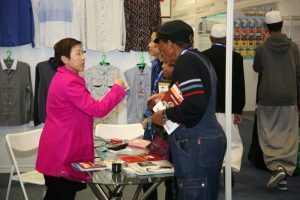 International buyers and the trade that takes place at SAITEX was a key focus for the introductory speaker Councillor Ruby Mathang, the MMC of Johannesburg City Council’s Department of Development. And after the ribbon cutting in Hall 4, marking the official opening of SAITEX 2016, the day got underway. SAITEX, which is Africa’s biggest show for retailers to discover new products from around the world, has a record number of exhibitors this year and Africa’s Big Seven has 300. Last night exhibitors spoke of their business successes following a successful first day. 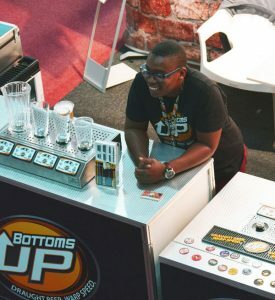 “We had the most amazing first day and met fabulous visitors from all over Africa – they were really important buyers,” said Michelle, Biz Box & Makebane Foods, South Africa. “It is day one of this three-day event and so far it has been already very valuable for our business,” said Cliffy Muthusamy, Sales & Marketing Manager, Huhtamaki, based in South Africa, overseen by its Finnish HQ. Day 2 commences at SAITEX with a second business breakfast conference with speakers including Councillor Parks Tau, the Executive Mayor of Johannesburg. And Africa’s Big Seven will welcome ambassadors who will meet their exhibitors from Botswana, Thailand, Sri Lanka, Tapei, Chile and Poland today.